All transactions are safe and secure with a reliable history in online purchasing behind each of our associates. Buy the Cousin Itt T-Shirt or Costume t-shirt to own Addams Family clothing and merchandise. It wouldn't be the freaky family we love without crazy characters like the dismembered hand Thing or lovable hair-covered Cousin Itt. If you wish you could decipher any of Itt's fast, high-pitched gibberish as easily as his family, then add this Cousin Itt t-shirt to your Addams Family tee collection. It will get as much attention as Morticia would if she were strolling down a beach in the middle of the day. If that sounds like a great idea, check out the Gomez and Morticia costumes below to make it happen. 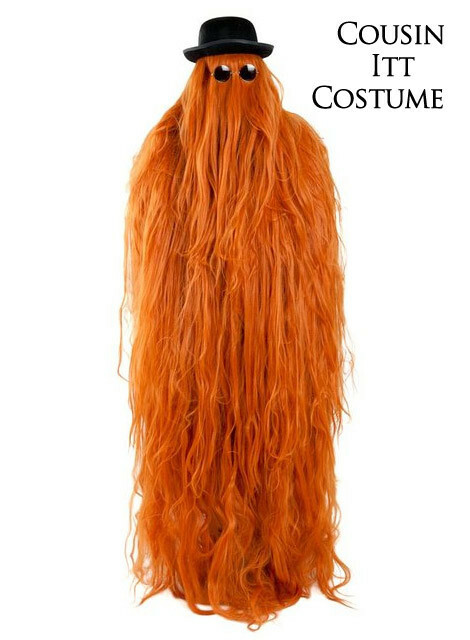 In addition to the Cousin Itt T-Shirt or Costume tee above, browse the Addams Family Clothing Gallery for more apparel like men's and women's clothes, kids shirts or hoodies.